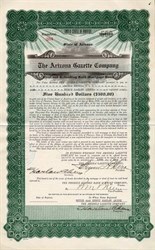 Beautiful certificate from the Arizona Gazette Company issued in 1926. This historic document was printed by the Goes Company and has an ornate border around it with the company name centered on the top. This item has the signatures of the Company’s President, Bryan Akers and Treasurer, Henry Harlow Akers and is over 92 years old. Charles H. Akers, publisher of the Arizona Gazette for 20 years, was a fighting pioneer. He was in the forefront of the fight for Arizona statehood and for construction of the Theodore Roosevelt Dam. His last crusade was for construction of a mainline railroad through Phoenix and the Salt River Valley. His vision of Arizona developed naturally from the nearly three years he served as Acting Governor of the Territory of Arizona between 1897 and 1901. He learned about his adopted territory from the community and county level in Prescott and from the territory and national perspective while holding the office of Secretary of the Territory and performing all of the duties of governor during the absence of the regularly appointed governor, Myron H. McCord, who was absent from Arizona in Washington, D.C. at the request of President William McKinley. Akers was a native of Iowa, where he was born in 1857. He was the son of John Holmes Akers, and with his family as a child, he moved to Kansas. When he was 23 years old, he moved to Arizona, locating at Prescott. His first work was in the mines in that vicinity. Later, with his brother, John B. Akers, he worked in a sawmill near Prescott. Becoming interested in mining a few years later, he moved to the mining district of Tip Top, in southwest Yavapai County. Railroad construction in the Salt River Valley attracted him and he worked as a section hand on the line then under construction at Tempe. When his brother died in Prescott, he returned there and worked as a bookkeeper in the 0. K. Grocery Store, operated by Joe Dougherty. Charles Akers entered politics at the age of 32 when he ran for and was elected recorder of Yavapai County on the same ticket with Buckey O’Neill, later of the famous Rough Riders. O’Neill was elected sheriff that year. Akers served two terms as recorder and then ran for sheriff, but was defeated. Shortly thereafter he was elected clerk of the Yavapai County Board of Supervisors, and while serving the county, he was appointed Secretary of the Arizona Territory, in the administration of Gov. McCord. Almost immediately he had the responsibilities of territorial governor thrust upon him, as the Secretary became acting governor in the absence of the governor from the territory. McCord was called to Washington by President McKinley, and was absent from Arizona during most of the following three years. These duties began in April, 1897, and continued during the governor’s absences until 1901. Just prior to his move to Phoenix as Secretary of the Territory, he became a senior member of the Akers, Tritle, Brown abstract company. After leaving politics in 1901, he organized the Akers Incorporating Company, and in 1902 bought the Arizona Gazette from Ned Creighton. He operated this daily newspaper successfully until 1913, when he bought the interest of John 0. Dunbar in the Arizona Democrat, which itself had absorbed the Phoenix Enterprise in 1907. During his experience as acting governor, Akers had come to understand the territory and its needs, and as an editor and publisher, he launched campaigns to accomplish three of what he saw as Arizona’s major needs­statehood, a federal reclamation system to help bring irrigation to Arizona’s vast agricultural region, and a mainline railroad through Phoenix and the Salt River Valley. For the irrigation objective, shortly after acquiring the Gazette, he joined with W. J. Murphy in an active drive to finance and construct the nation’s first big reclamation project, the Theodore Roosevelt Dam on the Salt River. He was chairman of the committee that raised funds to build a road to the dam site­that road which came to be the Apache Trail. Because of the support he gave to the entire project through the Gazette and by his own personal activity, he was honored by being chosen as master of ceremonies when the reservoir was filled for the first time. Residents of the Salt River Valley and many other parts of Arizona met in celebration on March 18, 1911 for the dedication. No sooner had the dam been dedicated by President Theodore Roosevelt than Akers was sent to Washington as head of a delegation that kept watch over the bill that was to make Arizona the forty-eighth state. The measure saw final passage in December, 1911, but Akers continued his vigil until President Taft signed it into law on February 14, 1912. With his part in these two major undertakings completed, Akers turned his energies toward a personally conducted campaign, with an ever-growing host of fellow supporters, to obtaining a mainline railroad through the populous regions of Arizona. Believing with deep conviction that mainline transportation meant the success and prosperity of Phoenix, he was instrumental in organizing various community interests in the Tidewater Main Line Association, and accompanied its officers on every trip to every town and crossroads in Maricopa County and other counties vitally interested in the project. Though essentially a fighter, Akers was noted for his kindliness, his generosity and his interest in the underdog. To all civic and charitable projects he gave his utmost support. His love for Arizona, and for the Valley in particular, was almost an obsession. When he died on April 14, 1924, of kidney failure in St. Joseph’s Hospital, Phoenix, his passing was mourned through the business and civic community. State offices at the Capitol were closed by order of Governor George W. P. Hunt. Funeral services were conducted at Trinity Cathedral in Phoenix, with Bishop J. W. Atwood, head of the Episcopal Church in Arizona, officiating. The Hiram Club of Phoenix held a special memorial service in his memory, and the Phoenix City Commission, as a body, attended the Cathedral services where the Shriners were participating with their traditional rites. Extremely touching are the thoughts expressed by old residents of Arizona, the pioneers with whom Mr. Akers associated as a young man about Prescott. Old miners, lumbermen, men with whom he worked in summer heat, those associated with him in politics and those he befriended during his long and eventful career in the territory and the state. Public officials and men in humble walks of life today join in expressing their sorrow at the passing of the pioneer. The Gazette that same day was filled with eulogies on his accomplishments. It was noted that he was president and general manager of the Arizona Gazette Company, as well as being publisher. Mrs. Jennie Bryan Akers, his widow, was vice president of the newspaper firm, with son Bryan as secretary and treasurer. Two other sons, Henry Harlow Akers and John Kelsey Akers, also survived him. At the time of his death, Akers held stock or had membership in these corporations related to newspaper publishing: The Merganthaler Linotype Company, the Phoenix National Bank, the C. H. Akers Incorporating Company, Audit Bureau of Circulations, American Newspaper Publishers Association, North American Newspapers Alliance, and the Associated Press. History from the Arizona Newspapers Association Hall of Fame. The Arizona Republic is a newspaper published in Phoenix, Arizona. It is the state's largest newspaper, and it circulates throughout Arizona. The Republic is the foremost newspaper in the city of Phoenix (466,926 circ.) and statewide as well. Since 2000, it has been owned by the Gannett newspaper chain. Early history The newspaper was started in the late 1800s, under the name The Arizona Republican. Back then, it was known for its rather racist points of view, particularly against Indians, blacks and Mexicans. Over the years, the newspaper changed its name and its views on race. Dwight B. Heard, a Phoenix land and cattle baron, ran the newspaper from 1912 until his death in 1929. The paper was then run by two of its top executives, Charles Stauffer and W. Wesley Knorpp, until it was bought by midwestern newspaper magnate Eugene C. Pulliam in 1946. Stauffer and Knorpp had changed the newspaper's name to the Arizona Republic in 1930, and also had bought the rival Phoenix Evening Gazette and Phoenix Weekly Gazette, later known, respectively, as The Phoenix Gazette and the Arizona Business Gazette ( Arizona Gazette Company). An investigative reporter for the newspaper, Don Bolles, was the victim of a car-bombing on June 2, 1976, dying eleven days afterwards. He had been lured to a meeting in Phoenix in the course of work on a story and the bomb detonated as he started his car to leave. Retaliation against his pursuit of organized crime in Arizona is thought to be a motive in the murder.